Kate Quinn's mom died last year, leaving Kate parentless and reeling. So when the unexpected shows up in her living room, Kate must confront another reality she never thought possible or thought of at all. Kate does have a father. He's a powerful politician. And he's running for U.S. President. Suddenly, Kate's moving in with a family she never knew she had, joining a campaign in support of a man she hardly knows, and falling for a rebellious boy who may not have the purest motives. This is Kate's new life. But who is Kate? When what she truly believes flies in the face of the campaign's talking points, she must decide. Does she turn to the family she barely knows, the boy she knows but doesn t necessarily trust, or face a third, even scarier option? Jenn Marie Thorne graduated from NYU-Tisch with a BFA in drama and quickly realized she was having more fun writing plays, short films, and superhero webisodes than actually performing in them. 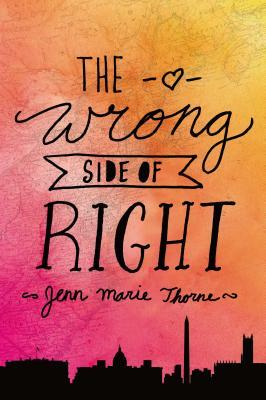 Then, when a flurry of political scandals hit the news, Jenn wondered what the kids at the center of the media's attention must be going through, and so began The Wrong Side of Right, her debut novel. Jen lives and writes in beautiful Gulfport, Florida, alongside her husband, two sons, and hound dog Molly.